Summer is coming to an end & there is no place like Sin City to celebrate the finale! Over 2 million visitors are expected to arrive in Las Vegas for Labor day weekend this year; add a ridiculous lineup of the worlds top entertainers and DJs and you start to understand why Vegas is the party capital of the world! With all the big talent and crowds in town at the same time it can be overwhelming to figure out what parties to hit up and when?! Have no fear the Ultra Vegas Party Pro's are here to help so you can worry about the more important things.. like which bikini to wear and what bottle to buy @ the club! 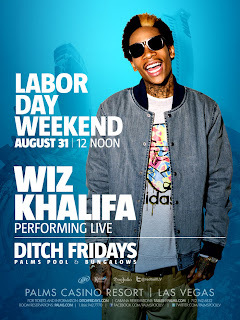 The Palms has a full weekend of fun planned, kicking off Labor Day with Wiz Khalifa Friday, Aug. 31 at Ditch Fridays and Taboo of the Black Eyed Peas at Rain on Saturday night, along with some of the best DJs and performers in town throughout the weekend at Ghostbar, Moon, Palms Pool & Bungalows and Rain. Pure Nightclub at Caesars Palace features Sky Blu of LMFAO on Friday, Aug. 31. Travie McCoy makes an appearance Saturday. Wet Republic at MGM Grand has a stellar lineup for Labor Day weekend. The Martinez Brothers and Boris will hit the decks and kick off the weekend Aug. 31. Global electronic phenomenon Luciano plays Sept. 1. The party continues with resident artist and performance DJ Sky Blu of LMFAO on Sept. 2. The weekend wraps up when acclaimed electro-house DJ Laidback Luke mans the turntables Sept. 3. LAX Nightclub gets things started on Friday with The Dirty’s Nik Richie, then on Saturday night, Ice T and Coco host. Hard Rock Hotel’s Kandy Vegas party goes on from Aug. 31 through Sept. 3, with a abundance of decadent celebrations going on throughout. On Friday, Summer Camp Fridays features Z-Trip, Richard Beynon and MisterE, while later that night, Vanity hosts the Kandy Welcome Party with Rev Run & Ruckus, MisterE and Teen Wolf. On Friday, HRH continues the party with Paradise Pool’s Kandy Vegas main event, featuring Chris Brown,Richard Beynon, Loczi and Steve Castro starting at 9 p.m., while Vanity features DJ Pauly D, Gettright and Loczi, with doors opening at 10 p.m. Body English hosts the Kandy After Hours afterparty starting at 2 a.m., with Zen Freeman, Caroline D’Amore, Stellar, Spinderella and more. Rehab Sundays features DJ Pauly D, followed by a second night of Body English’s Kandy After Hours, with two-time Grammy winner Paul Oakenfold and more. Finally, Oakenfold closes out the weekend at Relax Monday. Pink Taco also hosts Kandy Happy Hour between 8 and 11 p.m. Friday through Monday, so you can grab a bite in between all the partying at HRH. Iconic recording artist, record producer, actor and entrepreneur Sean ‘P. Diddy’ Combs will ignite Labor Day weekend as he hosts “The Sexiest Party in the City” at Chateau Nightclub & Gardens at Paris . Tao Beach and Tao Nightclub have some excellent talent lined up for the weekend. Tao Beach is headlined by Benny Benassi on Monday. At Tao Nightclub, Busta Rhymes puts on a special performance Friday and Erick Morillo spins Sunday. Marquee dayclub will be to the max Sunday featuring Kaskade on the decks. Wynn and Encore have some of the hottest names in Electronic Dance Music, David Guetta plays at XS Sunday and deadmau5 returns on Monday. Encore Beach Club will have deadmau5 on Monday and Surrender features Calvin Harris on Sunday. REMINDER: Labor Day Weekend 2012 will be very busy and Early Arrival Is a Must! Expect most clubs to be packed with party goers every night. And while this can make for a great party scene, it can also make clubs reach capacity fast so you absolutely must arrive early. 930pm-10pm is ideal for most venues. Clubs can change things last minute and we will update all our guests list groups as info comes in. Please be sure to Contact Us with any questions regarding your Ultra Vegas reservations.